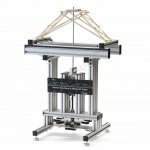 Evaluate the strength of model bridges and engineered structures by measuring the applied load with the Vernier Structures and Materials Tester. Utilizing both load and displacement sensors allows students to evaluate properties of materials (stress and strain). The Vernier Structures and Materials Tester (VSMT) is the perfect device for all project-based STEM and engineering classrooms. Use the Tester along with the engineering design method to design, build and test structures, conduct bridge competitions and investigate and analyze beam designs and material properties. The Tester is equipped with a load cell (measuring up to 1000N) and a displacement sensor (0.1mm resolution). Using both sensors allows you to record maximum breaking loads as well as load/displacement characteristics to allow students to evaluate stress and strain. The top support beams of the Tester are designed to easily slide and lock into position. Ruled markings located on the Tester allow you to accurately position the support beams for centre or off-centre loading. 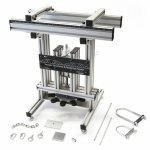 The VSMT ships with a well-outfitted VSMT Tackle Kit that includes a 50x50x6mm and a 50x80x6mm aluminum load plate, chain, rods, U-bolts and other accessories to make it quick and easy to load bridges, materials, beams and structures of varying sizes and shapes. Logger Pro 3 includes several experiment files to help you conduct the following activities with the VSMT. This activity is designed to allow the student to test a single unit and evaluate its performance and failure mechanism. Combine this activity with Logger Pro's Video Capture to analyze the point of failure, develop explanations and re-design the structure to improve performance. This activity is at the heart of the engineering design process. Students can explore properties of materials and beam construction. This experiment file is designed around the deflection of a beam supported on both ends and loaded by a downward force at its centre. The three pages of this file explore different aspects of the relationship between the deflection of the beam, the force applied, the length between the supports, the modulus of elasticity and the moment of inertia (by area) of the beam. 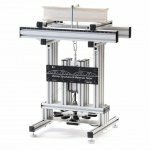 The Vernier Structures and Materials Tester (with VSMT Tackle Kit) requires a compatible interface and software to collect data. Interface and software sold separately. NOTE: As this product is large and heavy the international freight cost is very high and our price reflects that cost. Freight from us to you may also be higher due to size and weight.